We finally got the episode we have been waiting for since we saw those X scars on the backs of Daryl and Michonne. 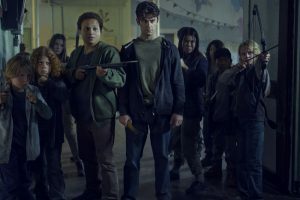 It’s a good episode and well directed especially the final act which is horrifying. 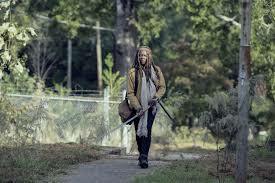 The episode opens with a flashback to Michonne searching for Rick along the river. She digs his gun out of the mud and cleans it lovingly. Time passes and we see that she is now pregnant yet still out there searching. She runs into Daryl who is also searching. She tells him he should come back to Alexandria but he doesn’t want to until he can bring Rick’s body with him. 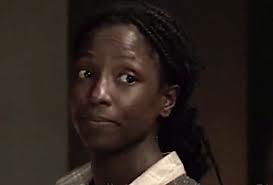 Half the episode plays out in flashback as an old friend of Michonne, Jocelyn (Rutina Wesley), shows up with a group of kids who seemingly were in need of help. Alexandria welcomes the newcomers, especially the children who have learned how to hunt extremely well and have caught a couple of deer that they prepare for a feast. Machine and Jocelyn get reacquainted, they knew each other in college and it’s been fifteen years since they last saw each other. All seems merry and bright until the next morning. Jocelyn and the new children are gone along wit Judith and the children of Alexandria and all their food and medicine. 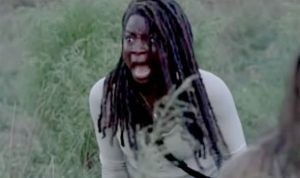 Michonne is horrified and scared! 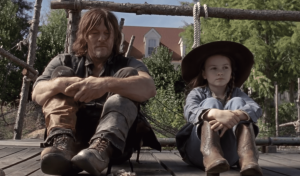 She and Daryl alone head out in search of Judith an the other children. In the present, Daryl shows up at the gates of Alexandria and Michonne reluctantly lets them in. She doesn’t trust Lydia and rightfully so especially as we watch the flashbacks of the last time she let someone in. She gives Lydia a talk, talking about her own experiences but basically telling her that she needs to leave. They do but this upsets Judith to no end! Judith is really upset with Mom. She wants Alexandria to be more inclusive. She wants to implement the “Carl Doctrine”. She really misses Uncle Daryl. They have a nice scene on a bridge, the first between the two. Judith is so upset that she sneaks out of Alexandria and follows her Uncle. When Michonne can’t find Judith she goes straight to Negan thinking she might be having one of their talks but she’s not there. 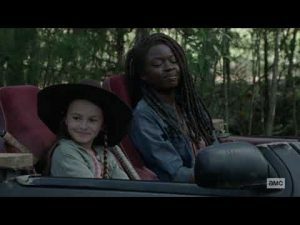 Negan tells Michonne that they don’t talk about anything in particular but she has lots of questions about her dad and Carl and the past and he answers all of them with candor. Michonne loses it. She’s been trying to shield Judith from all those things, trying to let her be a child as long as possible. Now she finds that Judith has been told about everything! From Negan of all people! When Michonne finds the note Judith left for her she takes off after her. Machine and Daryl are hot on the trail of Jocelyn and the children and they find them in an old school but holy crap! These kids are crazy! They get captured and strung up and Jocelyn forces the children to brand them with a big ole’ X! So now we know how that happened. Somehow Daryl frees himself and they split up to try and stop Jocelyn and the kids from leaving. Michonne ends up getting the crap beat out of her by Jocelyn before eventually overtaking her and killing her. Then, she has to face all those crazy kids! I was getting mad that she was trying so hard not to kill them! I was yelling at the TV! When one of those kids slashed her pregnant belly I just about lost it! 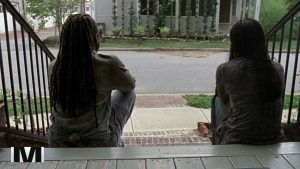 Finally, she started wiping them out but the scene was cleverly cut with present day Michonne wiping out a small herd of walkers. It was well edited and exciting. 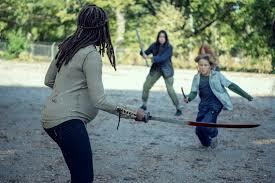 The conclusion of both past and present scenes was that Michonne rescues Judith. Her mom instincts are strong! Mom and daughter have a heart to heart and Judith convinces her that they need to help their friends no matter what. So with that, they saddle up the family punster and head out to The Kingdom to attend The Fair picking up some hitchhikers along the way (Daryl, Lydia, Henry and Connie). The last scene is ominous. A couple of Whispering scouts lurking outside of The Kingdom. Wait until Alpha and Beta arrive! It was great to see Rutina Wesley! I wish it was more than just one episode but she was effective. I was a big True Blood fan! Where the hell was Daryl when Michonne was facing off with those crazy kids? He shows up conveniently after all was said and done! Interesting that in the flashbacks Aaron didn’t have a prosthetic arm yet. Jocelyn and the kids escaped through the manhole and the sewer. Rick and Michonne had used the same thing to escape when Negan attacked Alexandria. They should have been on the alert to that threat! 1 Daryl, Carol, Ezekiel, Rosita, Negan, Judith, Henry and Tara will not die. 2 Father Gabriel, Saddiq, Eugene – one has gotta go! 3 The Fair will be the zombie apocalypse’s version of the Frye Festival. 4 The Highwaymen will help fight The Whisperers and their leader will die in the process. 5 Lydia will go off with Alpha, Beta and the rest. OR she may die! Causing all out war for Season 10!